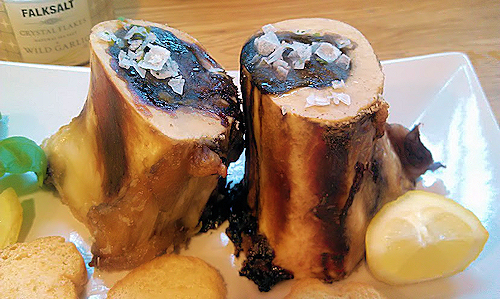 So I thought it was time to see what everyone was talking about when I saw bone marrow pop up in our local grocery store. WOW, we’re getting fancy here! I mean, this is hitting the big time! now if I can just get pork belly without driving 6 hours to get it. Oh and I just got a new box!!!! My Falksalt has arrived!! Keep reading, I am just a little excited! 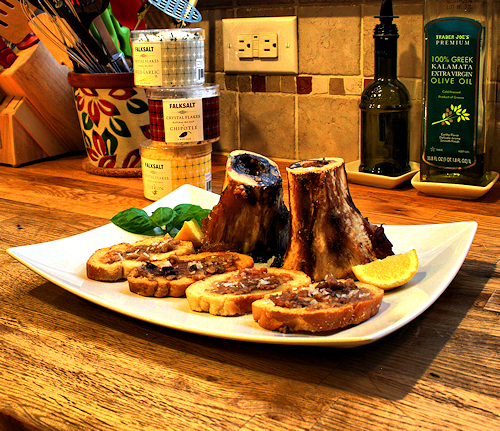 As I am making this bone marrow, everyone is steering out of the kitchen but I am determined to try this! I have heard such good things about it, not only the flavor but the health benefits as well. YES, I said health benefits. 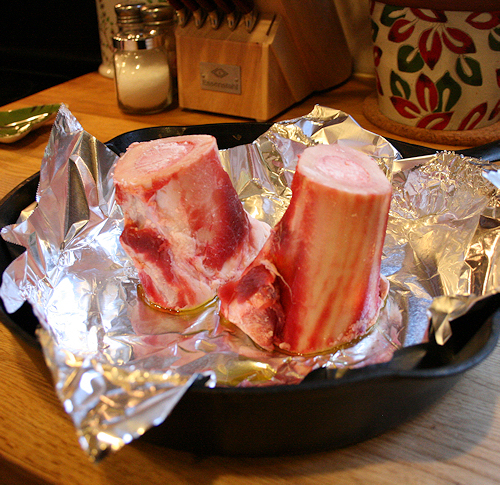 I was told my great grandmother used to make marrowbone meatballs. Maybe I can scare up that recipe. She swore by the health benefits, as well as the flavor it gave her soups and stews. It has no saturated fats, it contains calcium, iron, phosphorus, niacin and vitamin A(I got all that right off the USDA Nutrient database). 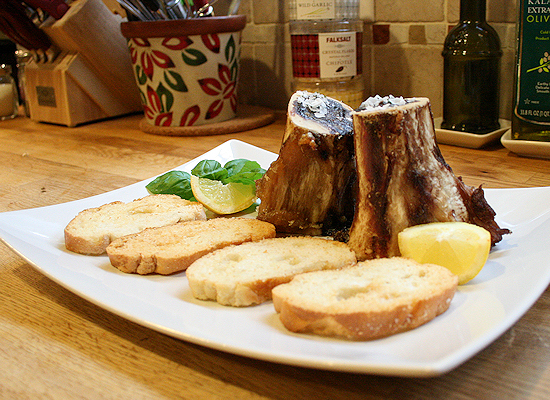 Also, science has shown that the fat from the marrow can boost and maintain your immune system. Pretty good stuff, but I am more interested in how this tastes, because let’s face it if it tastes like &*%^!, we are not going to eat it, are we? Well I’m not. So first thing I do is get out my cast iron pan and place these beauties smack in the center. 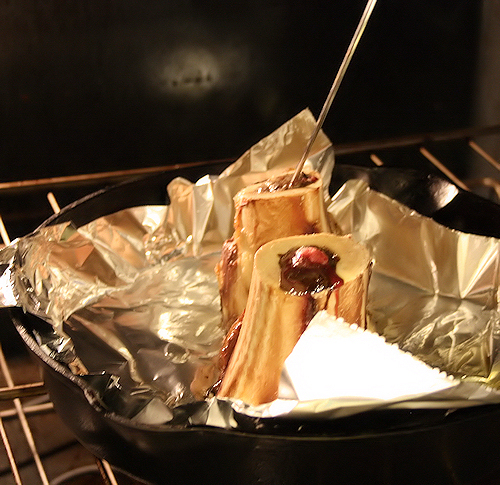 Preheat the oven to 450 degrees F and roast for anywhere between 20-40 minutes. Small ones about 20 minutes, but the large ones can range from about 35-40 min. I checked after 20 min and then again in 10 minute increments. I poked the center with a long skewer and if I came across resistance I knew it was not ready. It’s just like a cake. When it goes in soft and comes out nice it’s done. It should be soft and creamy white to almost clear. You can tell the temp by just touching your finger to the skewer where it came out. It should be HOT when ready. When it comes out of the oven, serve immediately. See, my plate is waiting patiently. 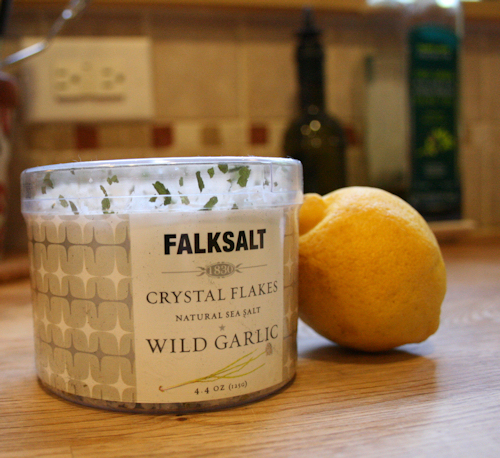 I chose to garnish mine with Wild Garlic Falksalt and lemon juice. You can also use crushed garlic or if you’d rather, roasted garlic. 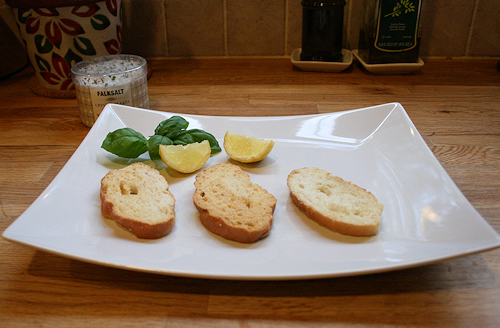 We dipped our knives in and spread it on some toasted french baguette slices. As we took our first bite, we both noticed the creamy texture, almost like butter and the nice spark of flavor from the Falksalt. I have to say it was yummy and very comforting. It is one of those decadent foods you can’t believe is so easy to make on your own. Definitely worth a try! I received a sampling of Falksalt in the mail and could not wait to use it! I have to tell you this is an amazing product. I love the flaked salt and the flavor it brings. Best of all was the ease of use and the bright flavor alternative to crushed garlic. 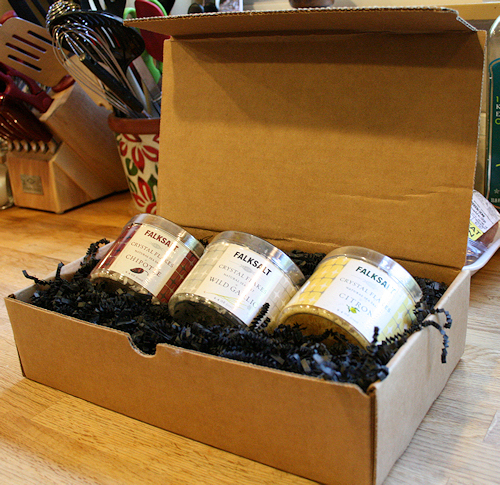 The flavors of these Falksalt’s are so vibrant, I am going to love using these on a variety of things to enhance my dishes. Click on the name to check it out. I am sure you will find a flavor to love.